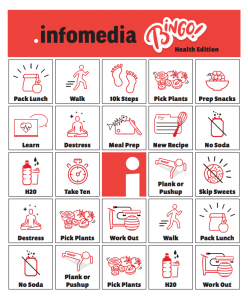 Want to join Infomedia on our quest to get healthier this summer? In the month of August, our office health initiative promises to create healthy competition. Want to join us? Download our free, printable Bingo game. Infomedians stay pretty healthy in general — a few of us tried Whole 30 this year, a few of us joined Weight Watchers, and several of us have regular fitness plans: Jimmy hits the gym after work, Russell and Jonathan train jiu jitsu, Carrie and Leslie took up kickboxing, Jason would be lost without his morning Iron Tribe, and Clay plans his workouts at CrossFit. But in the middle of this long, hot summer, even our best-laid health and fitness plans are lagging a bit. So, here at Infomedia, we think it’s the perfect time to start a little workplace competition to get us all inspired to push a little harder to get fit and healthy. We wanted to compete together, but we have very different diet and exercise plans. And competitions based solely on weight loss seem to punish both those people who lose weight slowly and those who’ve already reached healthy weights. Instead, we put together this Infomedia Bingo game that rewards small changes and positive strategies that meet each one of us at whatever fitness level we’ve already reached, encouraging us to take it up a notch. We’d love for you to join us! Here’s how it works: Each week, try to get a Bingo — that’s one completed row in any direction. For a little more of a challenge, try to fill out the entire card! Here at Infomedia, we’ll be competing for the grand prize of a Shipt subscription that will be awarded to the inter-office winner. Follow along and see who’s ahead by following us on Twitter, Facebook or Instagram. And if you want to join in on our health quest, just tag Infomedia and let us know how it’s going. To play, download your own Bingo card here. Details about what it takes to earn each square are listed below. Here’s to your health — and ours! Pack Lunch: Bring lunch from home. Try to make it a healthy lunch! Walk: Go for a walk that lasts at least 15 minutes. 10K Steps: Get 10,000 steps one day this week. You can track steps using your FitBit, phone or any other fitness tracker. Or you can take an hour-long walk instead. Work Out: Go to an exercise class, do a workout video, go for a run — whatever you like! Just make sure your exercise activity lasts at least 20 minutes. Prep Snacks: Bring healthy snacks and keep them at your desk this week. You might try keeping a fruit bowl on your desk, bringing in cut-up veggies or packing protein bars. Learn: Read a blog or book or watch a video or documentary about health or fitness and share what you learned with a coworker. De-stress: Take at least five minutes to de-stress — you can stretch, meditate or relax in whatever way you’d like. No Soda: Go at least one day without having a soda. Take Ten: Get up from your desk and walk around at least five times during your workday. Plank or Pushups: Plank for at least 30 seconds or do at least 20 pushups. Modified planks and pushups also count! Skip Sweets: Go the whole day without dessert, or cut out sugar for the day. Pick Plants: Try a new vegetable or fruit today, or go vegetarian for the day.